Formerly known in medical world, soda has outgrew their origins and became a widely consumed beverage since 1840s, available cheaply for the masses. Eventhough for some people soda might be a bad choice of drink because they believe consuming soda can ruin their health, soda still become people’s favorite drink until now. People drink soda for various reasons. 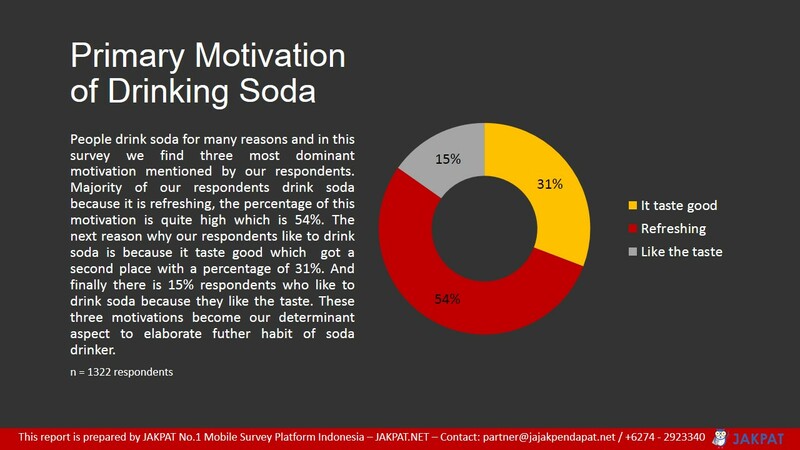 To find out more, we conducted a survey to gain an insight about soda consuming behavior especially motivation for consuming soda. 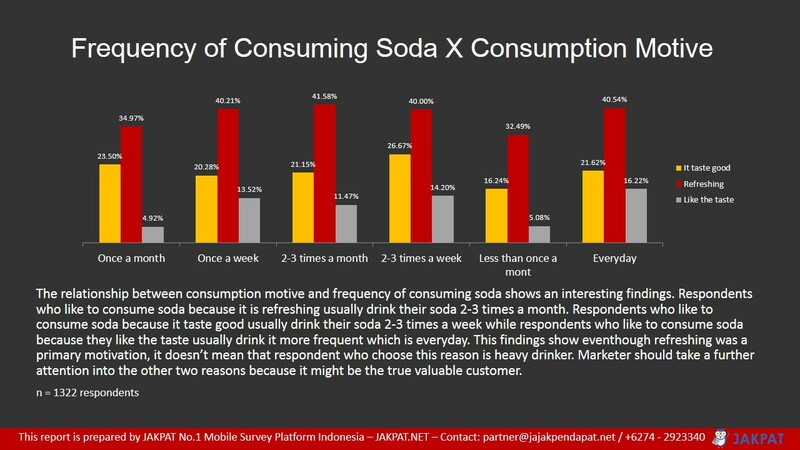 Among all the motivations for consuming soda which mentioned by respondents, we find top three reasons; because it is refreshing, soda taste good, and they like the taste. In this survey, we use these three reasons as the basic aspect to make the segmentation regarding soda consuming behavior by outlining several aspects. This survey is sent to our 1.322 panel in nationwide. Overall, we can see that although respondents have different motivation, their preference of daily occasion and location to consume soda are similar. However, in addition to these two aspects there is another aspect that with the existence of different motives produce different behavior as well. These aspects are packaging preference, frequency of consuming soda, beverage replacement, and so on. This entry was posted in Health, Lifestyle on December 18, 2017 by Fauziah Khoiriyani.